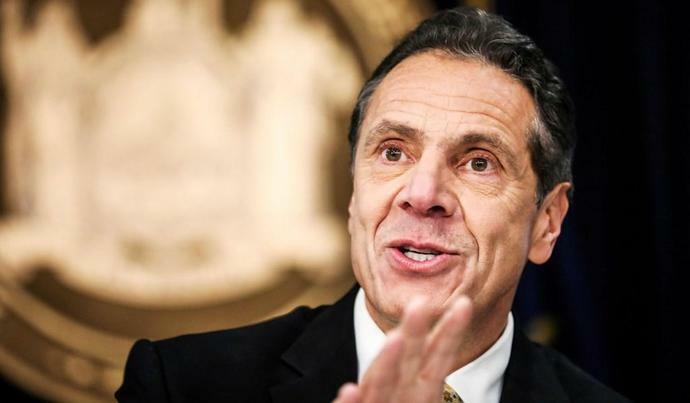 New York governor Andrew Cuomo hit back at President Trump on Wednesday, a day after Trump blasted the recent New York bill loosening restrictions on late-term abortions in his State of the Union address. "The president's diatribe was part of the far-right's escalation of its assault on a woman's constitutional rights," the governor wrote in an op-ed for the New York Times published Wednesday. During his address to the joint session of Congress, Trump criticized the late-term-abortion bills that have cropped up in New York and Virginia, and called on Congress to pass the Pain-Capable Unborn Child Protection Act, which would ban abortions after 20 weeks. "Lawmakers in New York cheered with delight upon the passage of legislation that would allow a baby to be ripped from the mother's womb moments before birth," the president said. "These are living, feeling, beautiful babies who will never get the chance to share their love and dreams with the world." Last month, Cuomo celebrated his signing of the Reproductive Health Act, which removes abortion from New York's criminal code and allows abortions for any reason up to the 24th week of pregnancy and if the fetus is non-viable or the life or health of the mother is in danger after the 24th week. Nevertheless, Cuomo claimed Wednesday that the law "does not allow abortions minutes before birth." The governor said he signed the law to protect against "Republicans' efforts to pack the Supreme Court with extreme conservatives" to overturn Roe v. Wade, the 1973 Supreme Court case that legalized abortion in the U.S.
Cuomo also clung to his identity as a Catholic despite his public flouting of the Church's teachings on abortion and other issues, noting that a large percentage of Catholics are pro-choice. "As a Roman Catholic, I am intimately familiar with the strongly held views of the church," he said, adding that he is a former altar boy and was educated in religious schools. "The decisions I choose to make in my life, or in counseling my daughters, are based on my personal moral and religious beliefs. Still, I do not believe that religious values should drive political positions." Cuomo also appeared to question the sincerity of the president's pro-life stance, noting that Trump was once pro-choice and charging that he now "shamelessly courts the religious right to win votes."